Rikugien Garden (六義園) in Bunkyō-ku is a beautiful Japanese landscape garden in Tokyo and one of the most visited gardens during the autumn season. The autumn leaves during this time are already past peak with some looking burnt and started falling on the ground. Those left however, especially in the Tsutsuji-chaya area, are still stunning. During this day too, the evening illumination has already ended, which was held from November 19 – December 07. View from the Tamamo-no iso with mixture of yellow, orange and green colors. Koishikawa Kōrakuen (小石川後楽園) is one of the oldest and best preserved parks in Tokyo and one of the surviving gardens from the Edo period. It provides one of the most pleasing autumn viewing spot in the city. During this week, the autumn colors in the park are already past peak but are still beautiful. The maple tree near Togetsukyo Bridge has lost most of its leaves but the area is still gorgeous. The Aoyama Icho Namiki (銀杏並木) or ginkgo tree lined avenue leading towards Meiji-jingu Gaien Park, is just a short walk from Aoyama-Itchome Station. 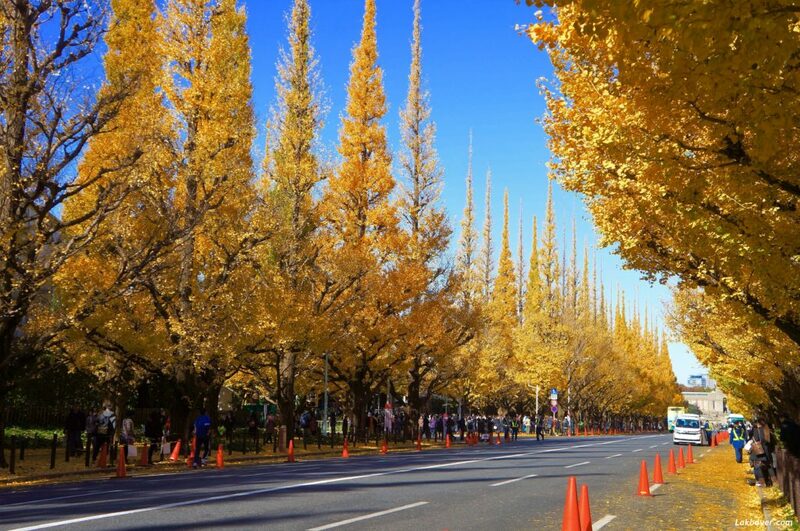 It is one of the most popular autumn viewing spot in Tokyo because this 300 meters long boulevard gets covered with yellow carpet of ginkgo leaves during the season. Most of the trees may have shed their leaves due to the previous day’s snow fall but some of the trees in the shade were still slightly green. 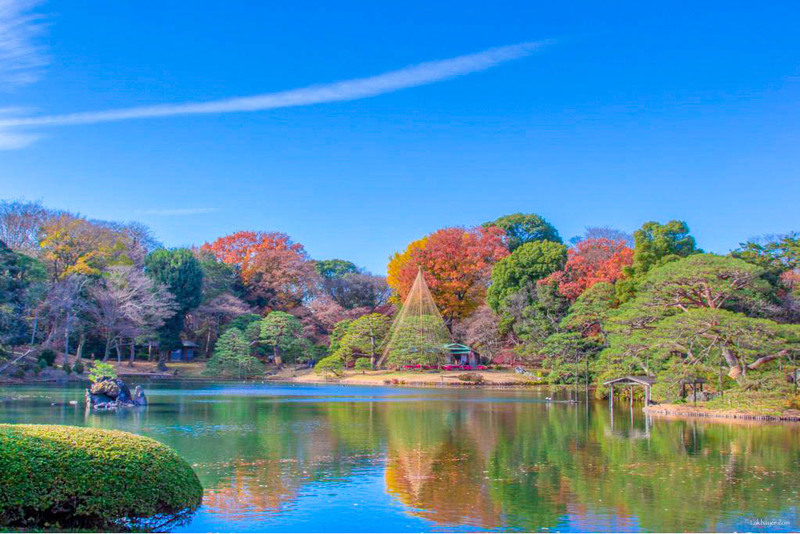 Shinjuku Gyoen (新宿御苑) is located just a short walk from either Shinjuku or Sendagaya stations. It provides a relaxing and tranquil atmosphere which makes it a popular destination in the busy city. Beautiful autumn colors brighten up today’s sunny day as the fall colors approaches its peak. The Japanese Garden, which is a favorite autumn spot, is beginning to show beautiful flashes of bright red. View from the Japanese Garden on this sunny day. 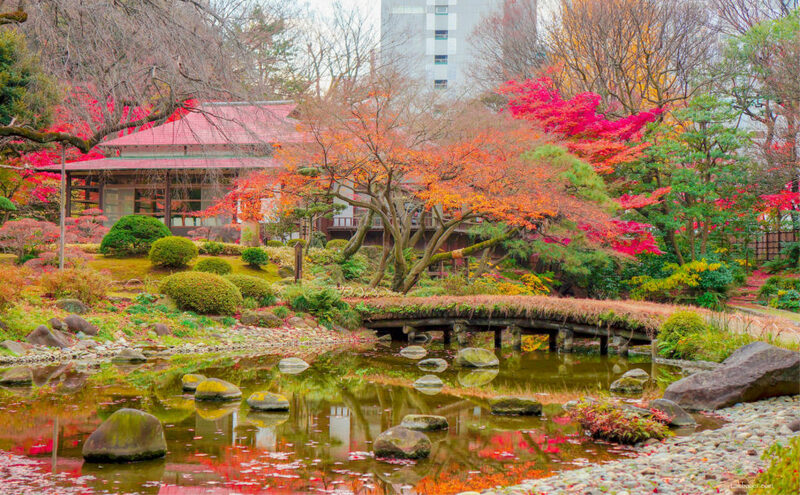 Hibiya Park (日比谷公園) is a public park that lies between the east gardens of the Imperial Palace, the Shinbashi district and the Kasumigaseki government district. 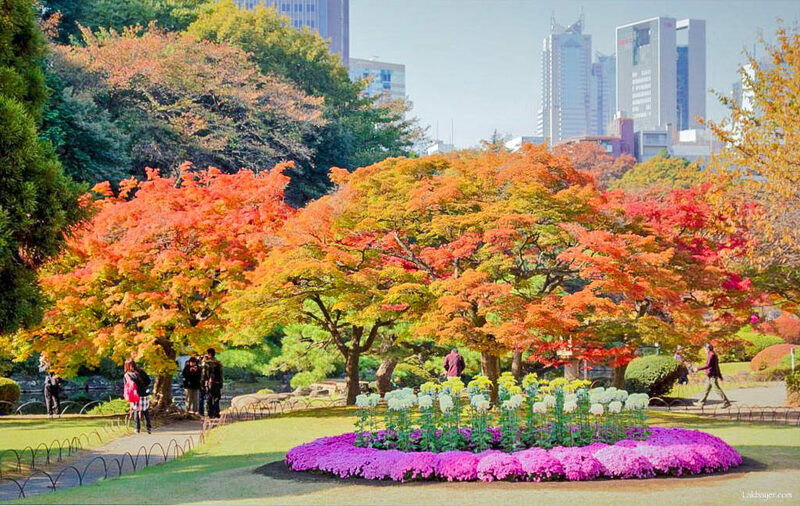 It is Japan’s first western modern park with flowers and trees for all season which makes it a prefect place of relaxation for people working in the nearby business district. 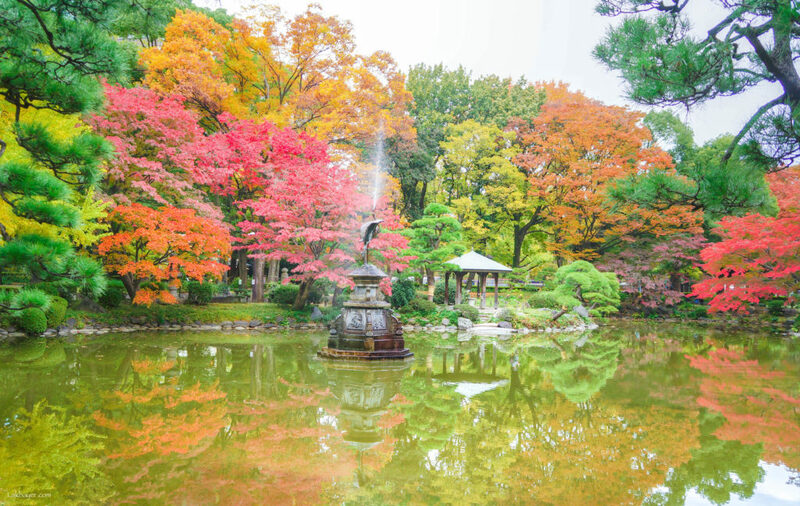 Gorgeous autumn colors are approaching its peak specially around the Shinkei/Kumogata Pond and Open-Air Concert Hall. Gorgeous fall colors around the Shinkei/Kumogata Pond.